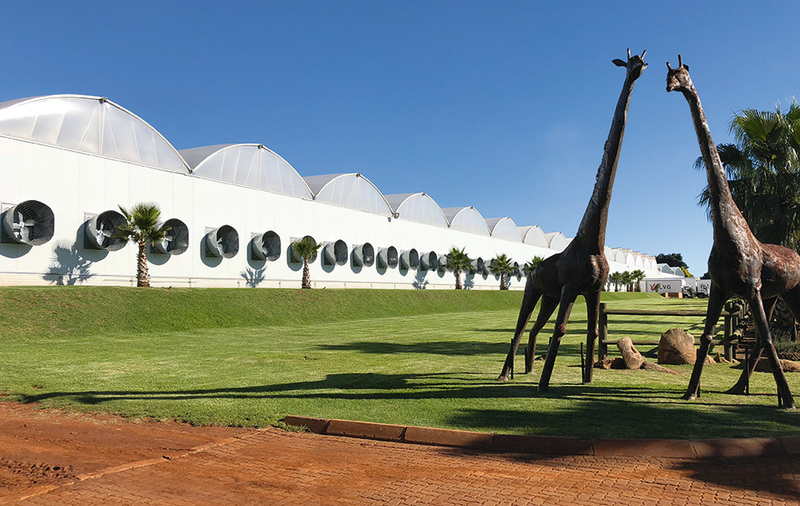 LVG Plants, the company of the family van Geest, the biggest plantgrower of South-Africa, sees a significant growth in trade in the last years. It has allowed him to invest substantially in sustainable energy, in newly built greenhouses and, next year, an extension of the farm. Soon, the existing greenhouses covering a surface of 11 hectares, will be extended with the help of the Belgian greenhouse builder VERMAKO. An additional 5 hectares of greenhouses will be constructed over a period of 3 years. This extension is partially destined for the growth of plantmaterial for the farmaceutical industry. LVG grows a big variety of tropical plants, bonsai and orchids. Heating is a necessity in wintertime, this is a sustantial expense. In 2016, this expense was one of the reasons for deciding to make a major investment in solar collectors. The field, with a surface of 1 hectare, the biggest of its type on the southern hemisphere, was installed by Bosman van Zaal and currently enables the heating in all the greenhouses. The grower is leading the way in sustainability and now has the intention to invest in solarpanels, in cooperation with Bosman van Zaal, which will supply the company with electricity. On the opposite side, it is important that the grower can ventilate the greenhouses optimally during summer. With the poly-ventilation greenhouse of Vermao, which allows the roof to open left and right from the ridge and not from the gutter, thus enabling continous ventilation, this works excellent, according to Geert. Vermako is one of the biggest marketplayers in the field of greenhouse construction in Africa. Next to the flagship of the company, the biggest greenhouse of cultivation of roses in the world, Sher Ethiopia, they also have customers a. o. in Kenya, Rwanda, Tanzania, Zimbabwe and South-Africa. Thema des GreenTech Summit bekannt gegeben!